Jerry Seinfeld is a working stand-up comic again. 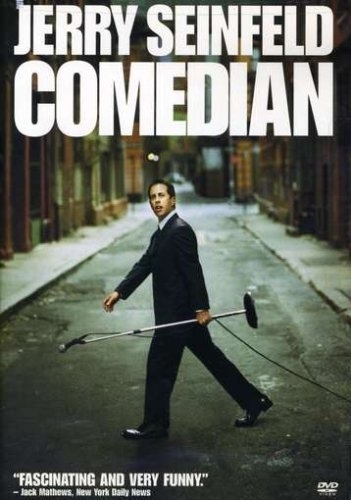 COMEDIAN is a candidly revealing, intimately observed, and often very funny look at what it takes to be a comedian. On-stage, Jerry delivers his hilarious brand of observational humor. Off-stage, he struggles with difficult material, confronts self-doubt, revels in small successes, and accepts help and support from friends and colleagues, including Colin Quinn, Ray Romano, Chris Rock, Garry Shandling, Jay Leno, and Bill Cosby. COMEDIAN also discovers the sharp wit of rising young comic Orny Adams — outspoken, insecure, and fanatical about becoming the “next big thing.” What emerge are two fascinating journeys by two contrasting personalities who have some surprising parallels. And though the documentary has lots of stand-up comedy, as well as appearances by comics such as Chris Rock, Jay Leno, Garry Shandling, Robert Klein and Bill Cosby, this is not really a concert movie. It’s actually a glimpse into the business of entertaining and the process behind making an audience laugh. “Comedian” is a funny movie, but it’s really more about the humor of anxiety and self-doubt than punch lines. Shot on digital video by Christian Charles (who directed Seinfeld’s snappy American Express commercials) and crammed with excellent jazz and pop music, the movie follows Seinfeld and a young comic named Orny Adams as they hit the road, work on new material and perform on “Late Night With David Letterman.” Adams — keyed-up and hypersensitive — doesn’t fare as well as Jerry but given that he’s sharing space in a movie with one of the most popular television personalities in history, he kind of has the deck stacked against him. And yes, Seinfeld, after being out of the spotlight for a while, does remain an interesting personality, even more so when caught on a relatively candid camera (Jerry curses?). His backstage conversations with Leno, Cosby, Rock and Colin Quinn reveal a guarded camaraderie, and fans who spent a significant chunk of the ’90s chuckling at the misadventures of Jerry, George, Kramer and Elaine will probably find it amusing that Seinfeld still actively worries he’ll bomb in front of a crowd. But for all Seinfeld’s agonized fretting over writing jokes and winning the audience’s approval, anybody who puts in 40-plus hours a week at an office probably won’t find much sympathy for a guy who has been given hundreds of millions of dollars doing the very thing he loves to do. Nevertheless, “Comedian” is a sharp, insightful, wry and occasionally stinging piece of business.